4.5 out of 5 based on 210 bloggers and 32 commenters. 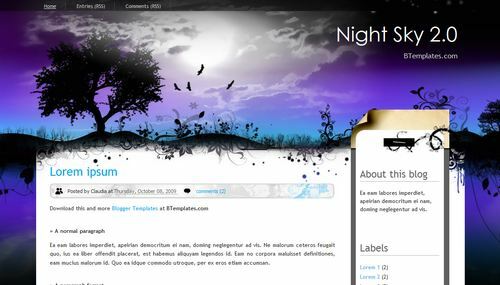 Night Sky 2.0 is a free blogger template with 2 columns and right sidebar. Excellent template for blogs about to write a diary, fantasy or nature. Thank you so much for this- its absolutely divine, gorgeous!! I want a “Dashboard” button on the top so I can post new blogs quickly. I love the look, I would like to roll out on my blog. I have downloaded to test, and I am having a few small problems getting things to fit and work, though I suspect these are easily fixed – I just don’t know how. 1. The “Post RSS” and “Comments RSS” links at the top of the page seem to lead nowhere, how can I link these so that it leads to a feed provider – or, as I can do this via a widget – how do I remove these? 3. The Post date seems to read as “Undefined” no matter which format I select. If any body could advise that would be great! Thank you so much, I now have what I need. This is such a fantastic site, and this is a brilliant template, I can’t wait to upload to my main blog! I have installed this template for 2 weeks..
anyone can help me? pls..
• look in the FAQs before asking those kind of stupid questions!!!! The problem is not the template, but something you made. If you take a look to the demo, you will see nothing wrong. In fact, we upload all images to Blogger itself, and we do not use photolava as an image hosting or somethink like that. If I wanted to replace the Blog title with an image that I’ve created could that be done? I have created a simple gif file with transparent background that shows my blog name with some effects done to the text. Still loving the template, but with time I have noticed a couple of things I would like to fix. I have had a look through the FAQ’s and the BT Blog and not spotted the solutions… I wonder if anyone can help? 2. Pictures – When I publish a post with a picture or pictures, it seems to stretch every picture across the full width of the post, regardless of what size setting I use in the post editor. Is this something I can fix, so I can edit picture’s as per the needs of my posts? Esse é o melhor template que eu já vi.Valeu! I have two problems with this design. thx 4 d person who uploaded this improved version of night sky.When i used night sky 1.0, there’s a glitch when i go to the comments page. the right column seemed to go down,WAY down. And only the 1st 2 comments look good with headers n stuff. The others seems to be with no header at ALL. But now all is well with Night Sky 2.0. THANKS!! i have a problem with this template. the sidebar’s end goes to the far left side of the screen in “posts” page (not “main” page) whenever i addmore than 5 widgets in the sidebar. any solution? @waikit: I see this problem somewhere and people asking for solution too but unfortunately there is none being offered so I decided to try experimenting it myself and eventually I found a fix for it. To those who are having the same problem as I am, see here: http://carillonavent.blogspot.com/2010/06/fix-for-sidebar-problem-night-sky-20.html sorry for the repost, there was a problem in the reply. I am having the Post date problem. I tried all the avaiable format but it isn’t showing at all. Thanks. @JW: Go to Settings/Formatting/Timestamp format and change the hour format (not the date header) to “Saturday, January 15, 2011”. @Claudia: Thanks a lot for this. It works fine. Thanks soooo much for this uber fab template!! Everything seems to be working great and it is extremely beautiful!! You have tremendous talent and thank you for providing it for free!! fabulous template but cant find Facebook, Twitter Share Options under Posts.. I am having the same problem of not being able to find the Facebook, Twitter and G+ share options under posts. Please update! How can I install this theme in a wordpress site?